We always liked those old fashioned nature documentaries with their portentious announcers. We were up at Hurricane Hill today, and the dirty sock plant (Polygonum bistortoides) is in bloom. This plant is noted for its hearty aroma. The scent hasn't really ramped up yet, but as we passed this field (shown at the right), we could almost hear the ominous bass voice, "... a field so full of dirty sock plant, it is known as 'the hamper'". 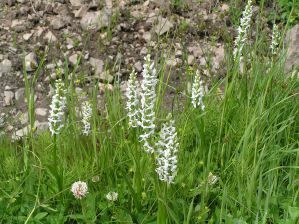 On a more pleasant olfactory note, the bog orchid (Platanthera leucostachys) is also in bloom near the start of the Switchback Trail to Klahane Ridge. This plant has a sweet, almost honeyish smell. We had noticed this scent on our last hike up the Switchback Trail, but had been unable to find its source. This time our search bore fruit, and good smelling fruit at that. 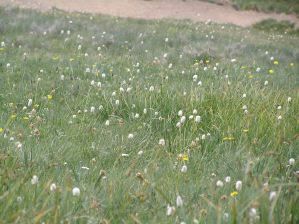 In any event, we should point out that the alpine wild flower season is nearing its peak of diversity. The yarrow is ready to open, the phlox and glacier lilies are passing. The season started early this year, and the true floral glory of the high meadows is upon us. We will provide appropriate aromatic HTML as soon as a few more browsers start supporting SE-CSS (scent enabled CSS). We apologize for the inconvenience, or maybe not. We were just opening a few bottles of red and realized that we are running low on Camaraderie Cellars' cabernet franc, so we need to drop by the Corsons and pick up a case. The work never ends. We found a new place in town. Salumi in Seattle has the best Italian salamis and other cold cuts we have ever tasted. Armandino Batali, Mario's father, runs a hole in the wall delicatessan not far from Pioneer Square, and the cured meats and sandwiches he produces are magnificent. A couple of the regulars at Nash Huber's farm stand started a catering business, and since we like their attitudes towards food, and local food in particular, we told them we'd mention them on our web site if they gave us a card. It took a few trips to the Farmer's Market, and a lot of Nash's great coriander, before we got our card, but here is the poop on their catering business. We were in downtown Seattle yesterday, so we checked out Palace Kitchen, one of the gems in Tom Douglas's growing empire. It is a big hopping bar of a place with a true emphasis on appetizers. We all know that the appetizers are where the flavor is, so at Palace Kitchen we indulged. Check out our review for more. The snows have melted at Deer Lake, so we were up the trail to take a look. The weather was scattered showers, so the sky was a mix of gray and blue patches. It rained under the gray and it was warm and bright under the blue. Since the sky was gray when we arrived, we stopped for a coffee at the Sol Duc Hot Springs resort. The pools were empty, and we were tempted to take a dip, but with the new whirlpool bath at Lake Crescent Cottage, we decided that we had mountains to climb instead. We headed down from the Sol Duc trailhead parking lot and passed by the falls. The Sol Duc falls were spectacular. There was a lot of water blasting through the rocks by the bridge, but we still had mountains to climb. The trail was usual stony self. The air was heavy and misty, so it was hard going. The trail was wet, but not impassable. We had to stop on the bridge to marvel at the waterfall. There was a lot of Pacific dogwood in flower for the first half of the trail, and a lot of glacier lilies as we got higher. 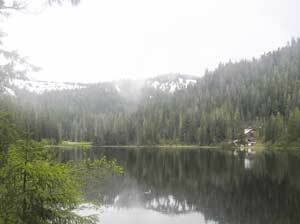 As for the lake itself, it was by turns brilliant and misty as you can see in our photo. The water was clear and fresh, and the snow seems to have melted all around the lake. You can see the snow above, and we hear that the Potholes are still in deep snow only a few hundred feet above. For more on this great trail, click here. The Switchback Trail to Klahane Ridge is open. We were up there earlier today and are pleased to report that it looks like a really good wildflower season. Already, there are avalanche lilies, violets, some yarrow and lots of greenery just waiting to blossom. We even saw the local marmot at the top of the ridge. This is a clearly auspicious sign. 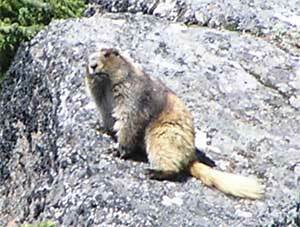 Those of us in on the secret know that sighting a marmot at Klahane Ridge at the start of the season means that we will have a sunny summer in the high country of Olympic National Park. The snows are melting! The wildflower season is upon us! 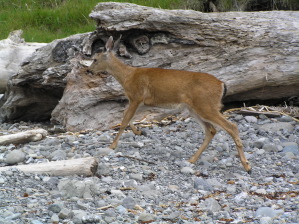 We had heard that Hurricane Hill Road was open. In the winter, this is the cross country skiing trail that runs from the Hurricane Ridge Visitors' Center to the Hurricane Hill Trailhead. It sometimes doesn't melt out until July, but this year it was open in early May, despite 374" of snow on the Ridge. We tried driving up last week, but it was foggy and rainy and a bit unprepossessing. Today was sunny, and you could see well into the mountains, so off we drove. Most of the snow is already melted and the wildflowers are already coming out. They were vacuuming out the parking lot at the Hurricane Hill Trailhead when we arrived for our hike. The trail was open, with just a few snowy patches. There were no glacier lilies or dirty sock plant yet, but the lupines, phlox, Indian paintbrush, and a host of other flowers were in bloom. Don't way for July, the alpine flower season has already started at Hurricane Ridge.